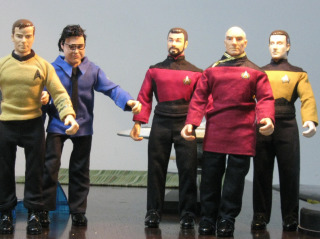 Some of the Star Trek action figures being sent to near-space in a high-altitude balloon May 5 are pictured here. For the first time ever, TV's beloved "Star Trek" captains James T. Kirk and Jean-Luc Picard will go boldy into near-space for real —in action figure form. A group of Trekkies has banded together to launch dolls of the two starship captains, as well as other key Trek characters and models of Star Trek spacecraft, to the edge of space using a high-altitude balloon. "Picard and Kirk are the greatest starship captains ever to exist and they've never been to space in reality, so I think it's about time we bring them there," said Logan Kugler, an entrepreneur and space enthusiast who launched a campaign on the crowd-funding site Kickstarter to raise money for the project. Kugler and his collaborators raised $6,193 through Kickstarter. They plan to use the money to loft six action figures, two starship models and five cameras to about 120,000 feet (37,000 meters) inside a balloon lifting off from Champaign, Ill. The team is using a pure latex Kaymont balloon to make the roughly three-hour flight to the edge of space and back. The launch is slated for May 5. The project is a labor of love for Kugler and his teammates. In addition to the Kirk and Picard dolls, which represent the captains of the original 1960s "Star Trek" television series and the 1987-1994 "Star Trek: The Next Generation," respectively, the balloon will carry figures of Next Generation commander William Riker and the android Data. The two captains will be placed atop models of their respective starships, Picard's USS Enterprise-D and Kirk's NCC-1701. Finally, the project is also flying custom-made action figures of J.J. Abrams and Roberto Orci, who directed and co-wrote 2009's Star Trek film. Kugler said he hasn't been in contact with William Shatner or Patrick Stewart, the actors who originated the James Tiberius Kirk and Jean-Luc Picard characters, but he hopes they get a kick out of the project. "I hope they like it and I hope I give J.J. Abrams and Roberto Orci their custom action figures and they put them up on the walls of their offices," Kugler said.